What's best in online learning design - 1st or 3rd person? You should show from the first person perspective to achieve higher retention and transfer. This is not surprising, when you think about what you are trying to achieve – cognitive change in the learner’s brain. First person is exactly how the actions will be performed in real life, so that viewpoint is more congruent with the eventual outcome. Yet most photographers, animators, graphic artists and video Directors’ are likely to create or shoot a third person perspective. There is the additional advantage in some tasks of a more open, less occluded view, as the hands and fingers are not covering the action. It may be trickier to shoot, as the instructor lies between the camera and the action, but it is right. This finding also lends weight to the use of first-person VR and AR in learning, where the learner is the viewer/director. VR gives the added benefits of total immersion, full attention, emotional impact, context and actual doing, which all add up to increased retention and transfer. Online design needs to pay more attention to findings such as this. Mayer has been publishing this stuff for decades, yet many are unaware of his work, which shows time and time again, that 'less is more'. Yet online learning design seems to have drifted towards ‘more is more’. For hundreds of other tips on online learning design from Mayer and other researched sources click here. Weapons of 'Math' Destruction - sexed up dossier on AI? Unfortunate title, as O’Neil’s supposed WMDs are as bad as Saddam Hussein’s mythical WMDs, the evidence similarly weak, sexed up and cherry picked. This is the go-to book for those who want to stick it to AI by reading a pot-boiler. 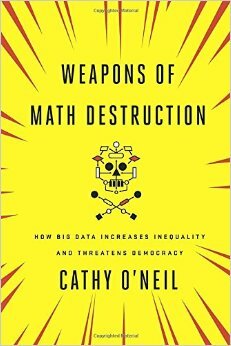 But rather than taking an honest look at the subject, O’Neil takes the ‘Weapons of Math Destruction’ line far too literally, and unwittingly re-uses a term that has come to mean exaggeration and untruths. The book has some good arguments and passages but the search for truth is lost as she tries too hard to be a clickbait contrarian. The first example borders on the bizarre. It concerns a teacher who is supposedly sacked because an algorithm said she should be sacked. Yet the true cause, as revealed by O’Neil, are other teachers who have cheated on behalf of their students in tests. Interestingly, they were caught through statistical checking, as too many erasures were found on the test sheets. That’s more (wo)man than machine. The second is even worse. Nobody really thinks that US College Rankings are algorithmic in any serious sense. The ranking models are quite simply statistically wrong. The problem is not the existence of fictional WMDs but poor schoolboy errors in the basic maths. It’s a straw man, as they use subjective surveys and proxies and everybody knows they are gamed. Malcolm Gladwell did a much better job in exposing them as self-fulfilling exercises in marketing. In fact. most of the problems uncovered in the book, if one does a deeper analysis, are human. Take PredPol, the predictive policing software. Sure it has its glitches but the advantages vastly outweigh the disadvantages and the system, and its use, evolve over time to eliminate the problems. I could go on but the main problem with the book is this one-sidedness. Most technology has a downside. We drive cars, despite the fact that well over a million people die gruesome and painful deaths every year from in car accidents. Rather than tease out the complexity, even comparing upsides with downsides, we are given over-simplifications. The proposition that all algorithms are biased is as foolish as the idea that all algorithms are free from bias. This is a complex area that needs careful thought and the real truth lies, as usual, somewhere in-between. Technology often has this cost-benefit feature. To focus on just one side is quite simply a mathematical distortion, which is what O’Neil does in many of her cases. The chapter headings are also a dead giveaway - Bomb Parts, Shell Shocked, Arms Race, Civilian Casualties, Ineligible to serve, Sweating Bullets, Collateral Damage, No Safe Zone, The Targeted Civilian and Propaganda Machine. This is not 9/11 and the language of WMDs is hyperbolic - verging on propaganda itself. At times O’Neil makes good points on ‘data' – small data sets, subjective survey data and proxies – but this is nothing new and features in any 101 stats course. The mistake is to pin the bad data problem on algorithms and AI – that’s often a misattribution. Time and time again we get straw men in online advertising, personality tests, credit scoring, recruitment, insurance, social media. Sure problems exist but posing marginal errors as a global threat is a tactic that may sell books but is hardly objective. In this sense, O'Neil plays the very game she professes to despise - bias and exaggeration. The final chapter is where it all goes a bit weird, with the laughable Hippocratic Oath. 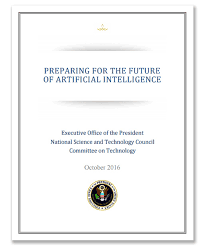 Here’s the first line in her imagined oath “I will remember that I didn’t make the world, and it doesn’t satisfy my equations” – a line worthy of Donald Rumsfeld, There is, however one interesting idea – that AI be used to police itself. A number of people are working on this and I think it is a good example of seeing technology realistically, as being a force for both good and bad, and that the good will triumph if we use it for human good. This book relentlessly lays the blame at the door of AI for all kinds of injustices, but mostly it exaggerates or fails to identify the real root causes. The book is readable, as it is lightly autobiographical, and does pose the right questions about the dangers inherent in these technologies. Unfortunately it provides exaggerated analyses and rarely the right answers. Let us remember that Weapons of Mass Destruction turned out to be lies, used to promote a disastrous war. They were sexed up through dodgy dossiers. So it is with this populist paperback. 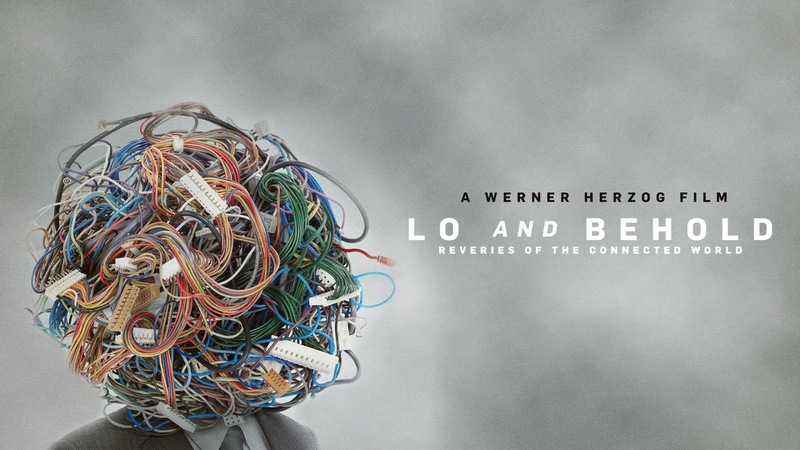 ‘Lo and Behold’ by the always strange Werner Herzog, is a meditation, nay a ten-chapter chronicle, on the internet - and it’s surprisingly good. I say that because he’s fundamentally a romantic filmmaker. As in Cave of Forgotten Dreams, he can drift into spiritual nonsense and does, in the middle of this film, feature some predictable Herzogian nutters. But on the whole he let’s the people he talks to do all the work, and they’re mostly smart and reflective – Kleinrock, Kahn, Ted Nelson, Zittrain, Mitnick, Rajkumar, Thrun, Musk. Some big minds here with some great insights. Kleinrock and Kahn were there at the start, with Ted Nelson (who thinks we got the web all wrong). The rest tease out some facinating thoughts on what they regard as perhaps the gretest and most significant invention of our species. It’s a journey from the first meaningful message on the internet (Lo...), through its evolution, enormity and emergent qualities. But its major theme is AI. Most science fiction missed the internet (it was all flying cars) and the internet, with networked intelligence, is posing some very profound issues about what it is to be human, smart but not human, and what the future may bring. It’s vexing me these problems, as I’m spending a lot of time talking about, writing and working in this area – believe me it’s both exhilarating and terrifying. Thrun talks about MOOCs and the fact that his Stanford students didn’t get into top 400 who finished the course. He sees education as one of the great gains from the internet. This was the man behind Google’s self-driving cars that are linked to the internet and learn, collectively, always getting better, passing this on to all unborn cars. See what I mean - this is smart thinking. There's robot soccer teams that work together as a team and learn to get better on tactics. The creator thinks robots will eventually beat humans in a soccer World Cup Final. The chimp robot that imagines and models its actions before performing them, giving a hint at consciousness. The emergent qualities of the internet – and it’s unpredictability. He also dips down into the dark side - with hacking and the horrific possibility of the internet being wiped out by a solar flare. This movie is well worth a watch. Sebastian Thrun, who has an EdTech company worth a billion, says something fascinating towards the end, “Almost everything we do will be done by machines… almost everything we do, will be done better by machines… because machines can learn faster than people can learn.” That is an astonishing statement. 20 ways AI will affect managers – why are HR & L&D so out of touch? Around the world, especially in the richer nations, the truth is dawning that we need less managers. The middle-class is now waking up to the fact that they are the new working-class, as their roles diminish. Technology destroyed employment in the fields and people fled to the factories. Technology destroyed employment in the factories and people fled to offices and management, Technology, especially AI, will destroy offices and management but there’s nowhere else to go. That is the great threat of our age. But HR and L&D are eerily silent. How many Leadership course are being delivered today without any mention of AI, despite the fact that we know that its impact has been and will continue to be huge? How many HR folk have the remotest idea of what is happening here? To sit back and watch this happen, without serious debate and preparation, is bizarre. A more immediate debate is how to cope with AI in the short to medium term. This report from the Harvard Business Review is a good start on ‘How Artificial Intelligence Will Redefine Management’. But surveys tend not to spot the really disruptive stuff, and as the respondents are the vey people that are likely to be affected by that disruption, they tend to be conservative. So first, a quick expansion of these five propositions but I’ll add the fifteen more I think they missed. A big one. As the survey showed that managers spend well over half their time on administration. This is precisely the sort of work that has already been automated to a degree by tools and will be increasingly done by AI driven systems. Monitoring, scheduling, reporting are all areas that are likely to be more automated through AI. The room for efficiencies here are enormous as organisations are essentially paying top dollar for relatively routine and banal work. Those surveyed seemed to think that this was an area that would remain relatively untouched by AI. I’m not so sure. The sort of expertise that leads to good judgment may also be under threat, as AI does the data gathering, analysis and production of insights. Recommendations (judgements) may well be AI driven. As Susskind in The Future of the Professions is packed with examples of judgment making AI, across a range of professions. There will be a pendulum swing as AI creeps forward doing more and more, eating into the judgment sphere. The report also shies away from the obvious conclusion that we will need fewer managers. They found that 78% of the surveyed managers believe that they will trust the advice of intelligent systems in making business decisions in the future. This raises the obvious question of how many managers we need to simply confirm these decisions. The anthropomorphic idea of ‘colleagues’ is also a bit odd. I don’t see Excel as a colleague. I see it as a tool. I suspect there’s still the idea that AI always manifests itself as a robot, at work here. It’s not so much managers treating AI as colleagues, as AI, through Chatbots treating managers as colleagues. I both get and don’t get this. Sure managers will need to develop higher-end skills to define and implement solutions but I’m not sure that ‘creativity’ is the right way to frame this. Whenever management theorists or educationalists run out of ideas they invoke the word ‘creativity’. It’s a big word that usually signifies – nothing. 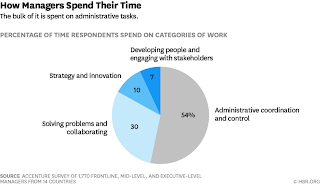 Nevertheless, it is certain that the hollowing out of middle management tasks and, I’d argue, middle managers, will result in more focus on higher order skills. Again, it is certainly the case that AI will not do the social stuff and managers will need more competences in these areas. What is more interesting is the way technology and AI will help achieve these goals. Social media has had a huge impact on organisations and management. That is already AI-driven. The contemporary manager needs to be able to harness AI to achieve these goals. OK, I’ll now add a whole lot more here. My criticism of the survey is that it doesn’t go far enough. AI is likely to have a far greater impact on specific domains, for managers, lawyers, accountants and most processes in management. Management consultancy has always had the whiff of hubris hanging over it. Young graduates in suits deliver reports that rely on back-end feeds and databases. McKinsey. Accenture, and many others are busy writing their trend spotting reports, bigging up AI and cognitive computing. Some of these reports are pretty good but what they never mention is the threat to their very own existence. AI will deliver the data, analysis, insights and reporting which they deliver. IBM have already moved massively in this direction by betting the house on AI-driven consultancy and services. Other will follow. Interestingly, the big four accountancy firms have all rebuilt their consultancy arms, raising the spectre of yet more corruption. This is an area that badly needs regulation. PwC bought Booz &vCo, Deloittes have been snapping up consultancies, while EY and KPMG have puffed up their consultancy side. That’s because the writing is on the wall, as we will see later for audit. But they may be divesting out of the frying pan and into the fire. Research organisations such as Forrester, Gartner and others rely in datasets to provide insights, which they synthesise into reports. At this level, their business, like Management Consultancy is under threat. More importantly this function has shifted from the outside to inside organisations the modern manager has to be be able to manage data harvesting, data management and AI-driven tools that lead to insights and decisions. These companies have already shifted much of the analytic task offshore to India, and other low wage economies, and have replaced human insight with data-driven, analytic software (read AI). The eventual result will be the use of AI driven insights directly or internally. Finance was revolutionized by the spreadsheet, which automated, not only calculations, but also captured formulae and models. This has gone a lot further with AI, where a huge volume of financial transactions and trades are now AI driven. Financial monitoring, processes (invoicing, cashflow, expenses), reporting and audits are likely to be much more AI driven, reducing the need for the admin and management in these areas. These have all been revolutionsied by technology but AI promises to do much more. The big disruption is likely to be in audit, where the big four dominate. All it will take is one radical player to offer AI-driven data gathering, analysis and report writing and there will be carnage. Audit is notoriously weak, witness the audits of the major banks that failed so dramatically in 2008. It relies on sampling and often incomplete data sets. AI driven accountancy systems should, in the future, be able to spit out audit ready accounts, and AI-driven audit software will crawl through that data and those accounts for discrepancies, inconsistencies, statistically odd figures and so on. As working from home has increased through the use of smart tech, mobile phones, web conferencing and cloud-based services, so the support role has shifted decade after decade from people to technology. The typing pool was the first to go. Back-end office support staff were next, then the secretary and now the PA. IPAs inteligent personal assistants, in the form of chatbots or other interfaces, like Amazon Echo, are likely to emerge, which act as personal PAs. They will act as a convenient interface to AI to do the mostly administrative tasks that managers needs, scheduling meetings, arranging travel, expenses and so on. The telegraph, telephone, email, Skype and messaging all changed management. They meant that comms were faster and cheaper. The key to good comms is dialogue and AI is starting to deliver real dialogue with technology. Speech recognition, text to speech, machine translation (in real time) have already had an impact. All of these are AI-driven. Chatbots are on the rise. Efficiencies in comms through the use of AI within the technology but also to improve its efficacy is coming. Chatbots now learn, through machine learning. The more you use them the better they get. AI will not only enable better comms in terms of delivery it will also shape comms in terms of quality. The simple example of email software which now does spellcheck or ways you when you’ve forgotten to attach the document are current examples. There will be a lot more. Much of the pain in management comes through projects – their planning and implementation. Software is invariably used to manage projects but the current crop is all too mechanical and tends to miss the subtleties, especially human behavior. Cloud-based, smart services are starting to emerge which are matched to the real needs of projects and will be able to spot potential problems, offer conflict resolution and do all the things that a Gantt chart will not do. Many managers have a hazy idea about marketing and the lack of skills in this area is often what makes a company fuzzy, leads to lackluster sales, and can take a company to the wall. There is a tendency in our all-too academically driven world to denigrate these skills but if you’ve been in business and tried to grow a business, you’ll know that is a necessary management skill. In marketing we’ve seen a seismic shift towards online, whether its online advertising, website or social media marketing. This is, in hte case of the big players algorithmically driven. We can expect this trend to continue. Sales management is always a trial. You have free-wheeling sales people who don’t like process but know that process and focus leads to sales success. Leads generation has shifted online and now involves AI targeting and delivery. Clumsy and ill-focused sales can be channeled and streamlined with AI. Salesforce have bought AI companies and set up Einstein, their AI service, others will follow. Call-centres will be replaced by AI-driven bots, self-service checkouts, touch screen ordering will replace wait staff. We buy more and more online and we've seen what Amazon have done with AI-driven recommendations. Managing customer service means being aware of the technology options and making sure that they fit into your organization. More and more customer service will be technology drive, and because it demands intelligent responses and AI will play a significant role in its delivery. No manager with responsibility in this area can ignore these developments. Nothing is more dispiriting for managers than dealing with contracts. “It’s with the lawyers” is a phrase that managers say while rolling their eyes, as that usually means “we have no idea when we’ll get it back”. Nothing is slower and more antiquated than legal processes. When two sides negotiate, they need a document that can be mutually accessed and AI-driven analysis to identify and help reconcile differences. These services are already available and will, undoubtedly, increase. That’s good news for managers, bad news for lawyers. See how AI will impact the sevices lawyers deliver. If legals can be sorted, procurement will be so much faster. Having spent a lifetime on the receiving end of procurement departments, I’ll be glad to see them automated. Scrappy, long-winded, episodic, email after email, form filling and processes. This should be a one-time transaction, with real dialogue in one session that gets everything sorted, This will be AI driven, as it’s a dialogue led process that simply matches suppliers to needs. Managers need to do less detail and delegate to technology, such as AI-driven electronic signatures, database searches and ID, that does it for them. In general managers will have to be more technology savvy and not just IT aware but be aware of the single most important development in IT since the internet – AI. If you are not thinking about how AI can help, you don’t really have an IT strategy. IT managers who get stuck in old models of simply shunting around files or buying enterprise-wide software that is not using AI, will find themselves less and less competitive. HR can’t continue to do the pay & rations thing, supplemented by a diet of dull compliance training, with the occasional staff survey, without considering the fact that there may be many fewer staff in the future. Their processes will be streamlined and made more efficient by being subjected to AI. Recruitment has already been influenced by algorithmic search, selection and matching. When LinkedIn bought Bright for $120m in 2014, it boosted revenues through recruitment and made its strategy clear. We have seen the slow abandonment of traditional HR and admin-heavy recruitment processes towards slicker, automated, online processes. This is an area ripe for falling fees and automation. Most managers already use AI for professional development – Google (pure AI), those management books you bought on Amazon (because they were recommended), social media (largely delivered algorithmically). It is clear that this will continue with AI created content, AI curation, adaptive learning and AI driven assessment. Al of these are currently available and used. As part of that professional development, managers should be starting to understand how AI works now. For example, get to know how Google really does work and learn some search skills beyond typing in a word or two. Understand how AI can deliver management tasks, financial, legal and in training. See these blog posts. AI will redefine what it means to BE a manager. Managers will be increasingly not managing people but harnessing and managing technology. Management used to be about people and processes but there are new ‘intelligences’ around, that also need to be managed. Old school managers who get their emails printed out or who can’t handle delegation to technology will struggle. The truth is that many will not be needed. Here’s a 21 option multiple choice question. In which areas will management have to deal with AI? The final option is All of the above!